Through our sister company Base Sound, we are able to offer a range of 1, 2 & 4 day live sound and studio recording training for both beginners and the more experienced engineer. Base Sound was established back in 2000 and since that time has taught literally thousands of students of all abilities from all over the world with many going on to work professionally in the industry. 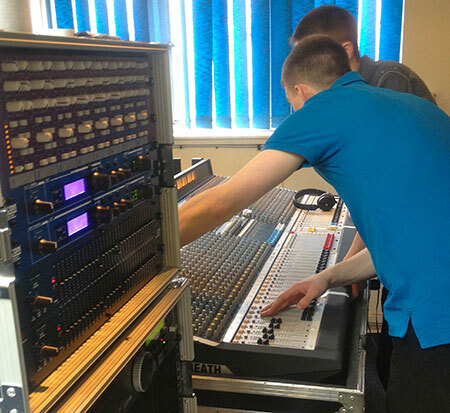 As well as the engineers that already operate their own systems our sound engineering training is also very beneficial for those looking to purchase some equipment in the future. With so much equipment available to buy it is hard know what specification of desk, amps, speakers etc is going to be suitable for you. Our training not only delivers the skills you need to operate the equipment but also invaluable information on the right products to buy. Should you choose to have a sound, lighting or AV system installed, we can also provide on site training so that you have complete confidence with your rig and are ready to engineer shows straight away.